This is a book by fans, for fans. Stranger Worlds is the second volume of this crossover series that allows IDW to borrow DC Comics characters to play in their sandbox. 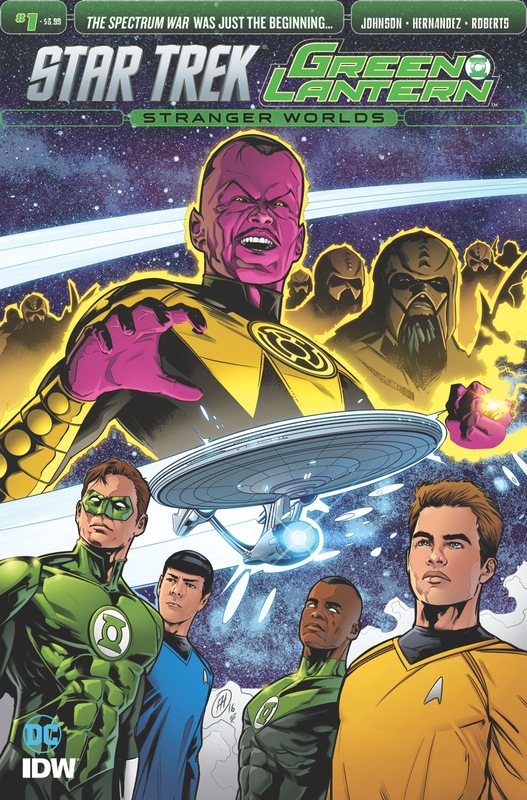 While the first volume focused heavily on the reboot Star Trek characters, this first issue focuses on the Lantern Corps characters. Between a small summary page at the beginning of the issue, as well as Guy Gardner giving a lecture at Starfleet Academy, the first volume is summarized well. The fact that this book is a joint editing venture, with multiple sets of hands on it could add up to bogged down trouble. Instead, the book moves smoothly between exposition, action and a build up of tension for the next issue. A large credit to this goes to Angel Hernandez art brought to life by Alejandro Sanchez colors. Mike Johnson uses an economy of words to get the story and concerns of the characters out on the page, and then the art team takes drives the majority of storytelling. There is a balance struck between showing the Lanterns in action outside the ship, while Kirk and company handle their traditional bridge roles. Dark gutters, breaking of borders and gutters every few pages, and offset layouts create a fast pace in both expositional and action sequences. Hal and Kirk occasionally resemble one another too much when face to face and no Lantern costume available. At one point Carol is only recognizable by color coded clothing. These lack of facial details do not slow down the story. The rest of the Star Trek crew continues to be drawn in their distinct, immediately recognizable fashions. This might be because the Trek character designs are based on actual actors. Meanwhile, the Lanterns are more in the eye if the artist. It’s possible to read this book with no prior knowledge of Green Lanterns and having just seen Star Trek. It is clear, though, this is written with fans of Green Lanterns in mind. Casual readers might find themselves lost, or not impacted by any reveals. All the biggest moments in the story rely on an understanding of how the various Lantern Corps interact with one another. There is also a new relationship that is mentioned but not explored, here. It is exciting to see just how Sinestro is wielding his new power, applied to Klingon culture. A new plot twist comes in how the rings function, or fail to function. The Lanterns are so far away from their power sources. It creates big questions. The Federation’s integrations of Lantern technology could raise ethical dilemmas later. There is massive world building occurring that read like many more volumes are possible in the future. If the rest of this second volume delivers on the fun of this issue, more will be welcome.